The day our Alaska cruise departed from Seattle was Chamber of Commerce-perfect. The sun was shining, the temperature was in the upper 70s, Mt. Rainier was out and the party was quickly in full swing. Unlike many of our fellow passengers whose first stop was a bar on the Lido Deck of our ship, Princess Cruises’ Ruby Princess, we headed for our stateroom and took a few minutes to unpack and organize. Virtually every cruise veteran we’d spoken to cited the same benefit: “You only unpack once,” so we decided to get it done, then relax. And relax we did! After taking just a few minutes to get settled and stow our empty luggage, we joined our fellow passengers in soaking up the sun along with a few drinks of the day. Together, we watched the Seattle skyline grow smaller as our ship headed west from Pier 91, then turned north into Puget Sound, heading around the city’s Magnolia area and past Discovery Park. Alaska, here we come! With a capacity of 3,000 passengers and 1,200 crew, the Ruby Princess is a big ship. While only about half the size the ship that is currently the world’s largest cruise ship - Royal Caribbean’s Harmony of the Seas - she towered over Holland America’s ms Amsterdam, which was docked next to us. For comparison, the Amsterdam is able to carry 1,380 passengers and has a crew of 615. 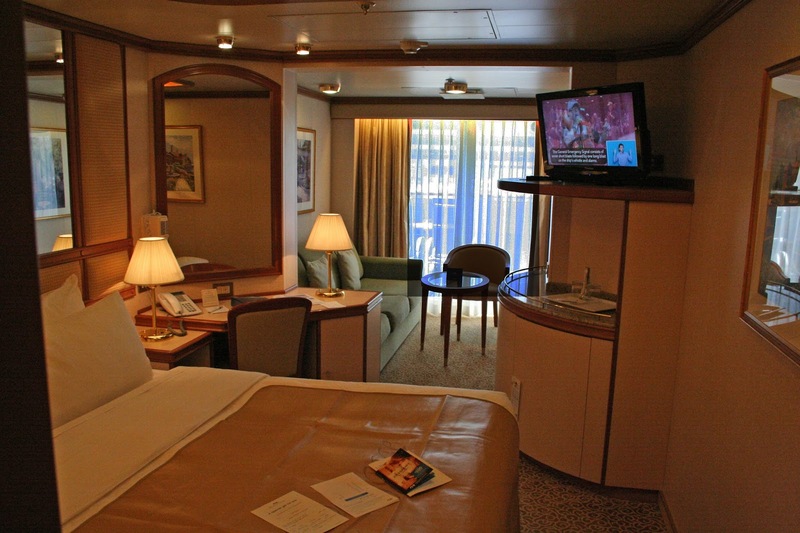 Once we arrived at our stateroom, a mini-suite, the sense of size took on a more reasonable proportion. With an overall footprint of slightly over 300 square feet, our cabin’s sleeping and living areas totaled a bit under 200 square feet with the verandah taking up another 40. The rest was divided among a generous bathroom and closet, and entry hallway. Although the second largest of the stateroom categories, it was cozy and we agreed we wouldn’t have wanted anything smaller for our seven nights at sea. After watching the Seattle skyline fade away from our perch on the Lido Deck, it was time to join our group for dinner in the Botticelli dining room, the facility that offered “traditional” seating, which is seating at a designated table and a fixed time. We arrived at the appointed time of 5:30 p.m. The dining room filled quickly and our first impression was that the atmosphere was very loud. Further, because everyone arrives at the same time at the traditional dining room, service slows down considerably. However, we agreed that the staff was very attentive despite the pressures of a large group descending all at once. More thoughts about on-board dining later. Awaking on our first morning at sea, we were a bit overwhelmed. We woke up earlier than we expected, probably because morning comes early in the summer at our northern latitude. On our day in Juneau, which sits above 58 degrees northern latitude, sunrise was 3:49 a.m. Many people are just going to bed at 3:49 a.m. While our goal had been to avoid buffets, we could not readily identify a restaurant that had table service at breakfast and the breakfast room service menu was somewhat limited, so we surrendered and headed to the buffet. We quickly realized the value of rising early: the buffet had no clearly defined traffic pattern so, once the crowds arrived, it became rather chaotic. Later in the morning, a friend told us about one of the restaurants, the Da Vinci dining room, which offered table service at breakfast. Interestingly, neither that particular restaurant nor breakfast options in general were listed among the dining options in the in-room guide, though they were included in the daily newsletter called Princess Patter that was left in our stateroom each day. This was our first cruise, and our first day was entirely at sea. It was a great opportunity to get to know the ship and all its quirks. Each time we took an elevator, we had to re-orient ourselves: are we forward or aft? Is our destination on this floor starboard or port? We exceeded our 10,000 step goal every day at first, simply because we got lost. As we wandered the decks – in five-foot seas and a 17-mile-an-hour wind – we found that some advance route planning would be helpful when heading to a specific destination. On our ship, the various elevator banks did not all go to all decks. The mid-ship “lifts,” as they’re called, have two discrete banks. One goes from Deck 15 to Deck 5, while the other goes as low as Deck 4, which is where the medical center is located. To get to some of the specialty dining venues on Deck 16, youth center on Deck 17, nightclub on Deck 18 or sports courts on Deck 19, which are all at the stern, the easiest access is via the elevator bank at the stern, as not all decks have paths that go all the way around the ship. The same was true to reach several venues near the bow; the easiest way was to use the forward elevator bank rather than taking the nearest bank to the appropriate deck, then heading toward the destination. In my opinion, food at the standard dining venues was good but not great. That is understandable at the buffets, as food must be precooked and held on steam tables. However, it is also likely the case at standard lunch and dinner venues, whether traditional or “any-time” seating, as folks tend to arrive at the assigned hour (traditional) or when the any-time venues first open. The kitchens must have food pre-prepared and ready to be plated for quick service, which detracts a bit from the quality. Food at the specialty dining venues, including the Crown Grill and the Salty Dog Gastropub, was much better than the included venues as more dishes seemed to be prepared to order rather than pre-cooked and standing by. He’s too picky; the food in all the venues was just fine, although I agree the best was to be found in the specialty venues. In both the included dining venues and the specialty restaurants, we noticed that portion size was more modest than most land-side restaurants, which is actually a good thing for a number of reasons. Most American restaurants serve portions that are much larger than guests need, leading either to wasted food or overeating. Also, considering that the average cruise includes older patrons whose appetites are smaller than they once were, smaller portions are more appropriate. Besides, with the panoply of food purveyors on the ship, between-meal snacks are readily available. We also noticed that our fellow guests “of size” seemed to gravitate to the all-you-can-eat buffets as opposed to the full-service venues. No surprise there, but one can take a cruise, eat well yet modestly, and not leave several sizes larger than when you boarded. In addition to traditional cruise fare, healthy choices including fresh vegetables and fruits for salad and dessert were abundant in the dining rooms as well as the buffets. Our personal favorite place to eat was the Crown Grill. It is a specialty dining venue and meals carry an additional cost unless included in a special package, which we had. 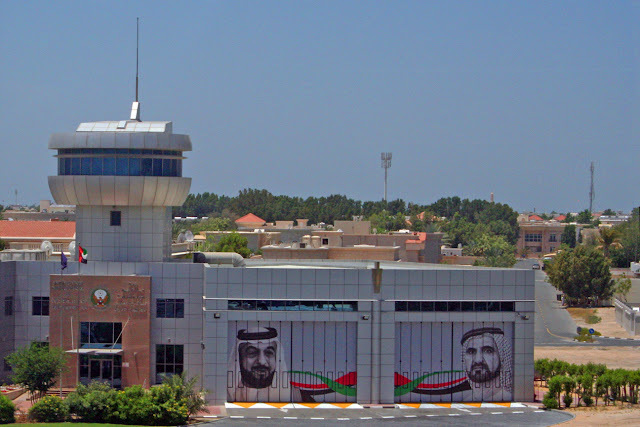 Even those passengers who do not have such a package will find the prices to be quite reasonable. For $29 per person, guests enjoy an appetizer and salad or soup, a main course ranging from fish to filet mignon, and dessert. Compared to land-side steak houses, it was a real bargain. Fare at the Salty Dog Gastropub was a bit more casual with a focus on items including crab cakes and the signature Ernesto burger. The price was more modest as well: $19 per person. For the number of small plates provided – three, plus French fries – it was an excellent value. Passengers could also choose from SHARE, a restaurant created in collaboration with celebrity chef Curtis Stone, and the Crab Shack. 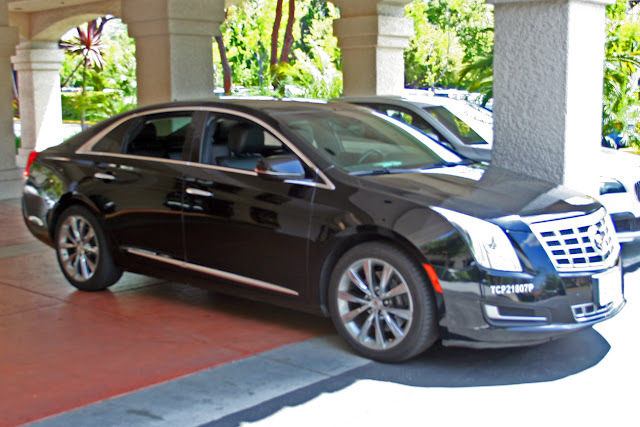 As noted in a previous article, optional gratuities packages are the current industry practice. While they can be adjusted or removed at a guest’s request, assuming that each of the 1,500 staterooms pays $200 in gratuities for the seven-night sailing, that’s a tip pool of $300,000. If it were divided among one-third of the ship’s 1,200 crew, or 400 people who work front-of-house positions, that would amount to $750 per person for eight days of work; less than $100 per day – and cruise ship crew members put in days that average 13 hours, we were told. Our experience bore this out, as we would see a waitperson from a specialty restaurant in the evening working in a more casual setting the next morning. And our stateroom steward always seemed to be around, whether morning, midday or evening. Having worked in the hospitality industry, Carl felt the amount of tips was a bit on the low side, so he brought a cache of small bills with which to tip our room steward, bartenders and the other front-of-house people who took care of us. Only one gentleman politely declined; the rest accepted the extra few dollars offered graciously and gratefully. A benefit of the tipping was that we were remembered, by name, by bartenders and wait staff, once again making us feel like VIPs. One of the most pleasant aspects of the cruise was being pampered in very pleasant surroundings. The physical property and the service were equivalent to many upmarket hotels. The bed was very comfortable, the room was excellently maintained and kept very clean. Especially important to us, the bathrooms were sparkling. Room service trays left in the doorway were removed promptly. In the hallway or on any of the many decks, smiling staff members greeted us with a pleasant “Good morning!” or “Good evening,” and often inquired if there was any way they could be of assistance. 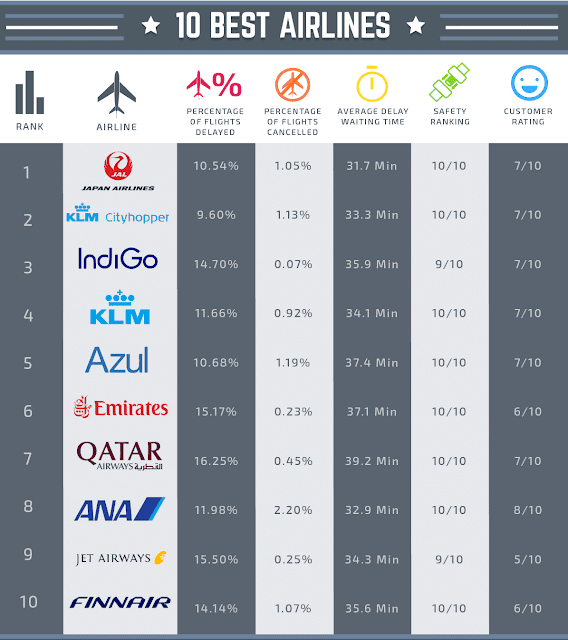 Great service, great way to make passengers feel like valued guests instead of merely paying customers. Among the most interesting aspects of our cruise was our conversations with the people who staff the ship. Cruise ship employees come from a wide variety of countries and have stories that are just as varied. Our stateroom steward Mark hails from the Philippines. Vanessa, one of the bartenders we came to know, was from Peru and was a purist about mixing cocktails, giving her and my husband, who has also spent his time behind bars, a lot to talk about. Fellow bartender Rafael’s tour on the Ruby Princess meant months away from his family – and pregnant wife – in Brazil. He expects their second child to arrive shortly after this season’s contract ends and he returns home. Tarra, our waiter at the Crown Grill as well as Café Caribe, also hails from the Philippines. He took care of us as we celebrated Jamie's birthday with dinner at Crown Grill and, as we each had birthdays during the cruise, when we returned to celebrate Carl’s birthday. Tarra was prompt, attentive, and added just the right touch of lightness and humor in a more formal setting. He clearly enjoys his work. Vesna, a hostess at the Crown Grill, is from Slovenia. Her patience in helping us to change reservations – twice – was typical of the service we received: always gracious and accommodating. Felix, the manager at Crown Grill, was more than happy to “talk shop” with another person “in the business”, making us feel more like insider friends than simply guests at dinner. With regard to both food and entertainment, the Ruby Princess has the kids covered. It has kids’ clubs for varying ages, two pools, and on the pool deck, food outlets offering ideal kid fare: pizza, burgers, hot dogs and ice cream. In the library, activity sheets for the kids as well as board games are available. On one day we observed a paper airplane flying contest; another day a cake decorating opportunity for junior chefs; a third day offered a visit by husky puppies being raised to race the Iditarod. Their owner boarded at Skagway just to show off the puppies and give some background on raising them. Cruise company photographers are everywhere, taking shots of guests relaxing by the pool, disembarking for an adventure in a local port, or dressing up for formal night. The photos are displayed in a gallery along one of the decks and are available for purchase, either individually or as a package. Our cruise visited three Alaska towns: Ketchikan, Juneau and Skagway. In addition, we cruised through Endicott Arm to get a view of the glaciers. In each of the towns, local merchants told us that “the cruise lines” had purchased and ran many of the shops and stores one encounters. To our observation, it seemed that the stores one came to immediately upon disembarking were most likely to be owned by the lines, and many were jewelry stores; farther into the towns, visitors were more likely to find establishments that were locally owned and offered more local wares. Many stores in all three cities had signs in the window proclaiming their local ownership. While stores owned by the various cruise lines no doubt employ local people and add to the areas’ economies, visitors who want to support businesses that are 100 percent locally owned and operated will need to look for such signs or, when in doubt, ask. Of those three towns, we found Skagway most appealing. The day we visited was the 40th anniversary (they called it “birthday”) of the National Park Service’s National Historical Park in Skagway. While not a National Park in the same sense as Yellowstone or Glacier National Park, private, city, state and federal interests have cooperated to preserve or restore the late-1890’s atmosphere of Skagway’s Historic District, according to a Park Service brochure. The majority of the area is freshly painted, there are abundant plaques describing the various features that visitors will pass by, public restrooms are abundant, and the town genuinely captures the 19th century feel. 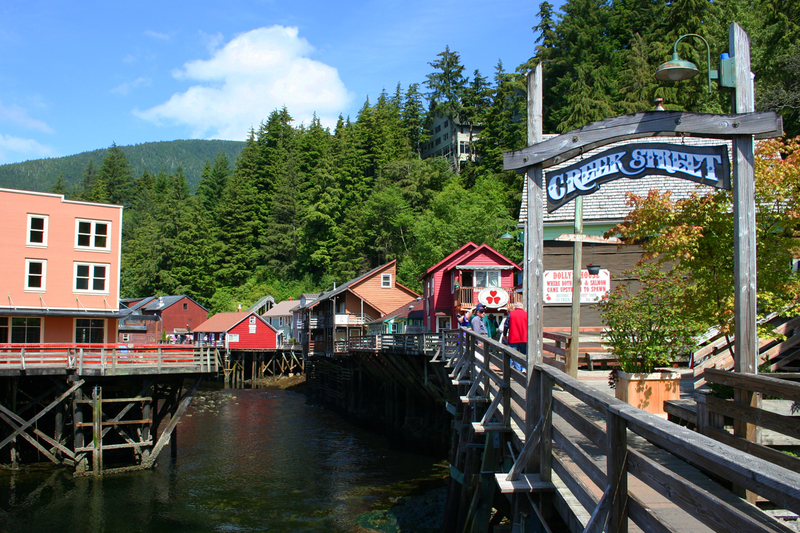 Ketchikan, our first stop, was our second favorite Alaskan port. Its history dating to the days of the Gold Rush gives it a certain cache, as does its ties to Native Americans and their history, including the Totem Bight State Historical Park and the Saxman Village's Totem Park with its collection of totems. 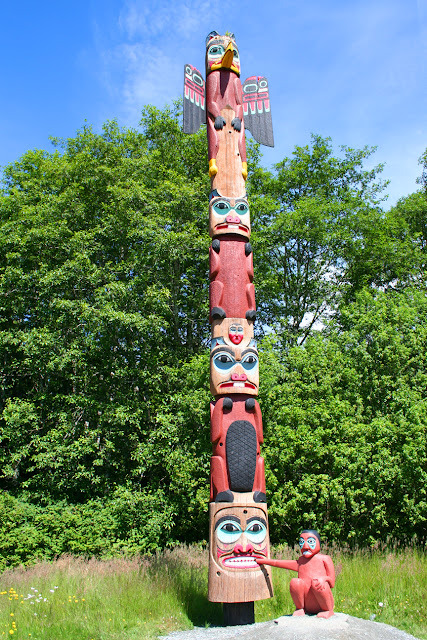 “Totem,” we learned, means “pole” so the phrase “Totem pole” is redundant. 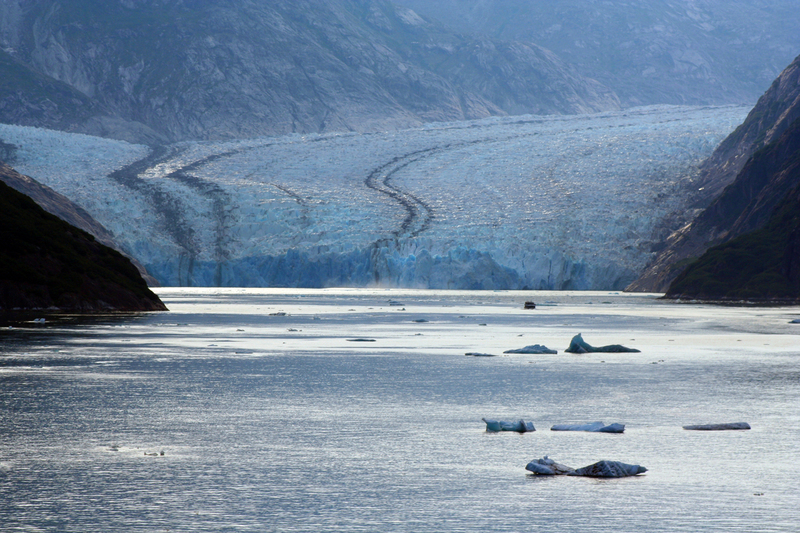 Juneau, the state capital, is an excellent jumping-off point for tours to other regional points of interest. While the State Capital and the Juneau museum are within walking distance of the pier and the town has many shops and stores, in our estimation Juneau lacked the charm of the other two Alaskan ports. 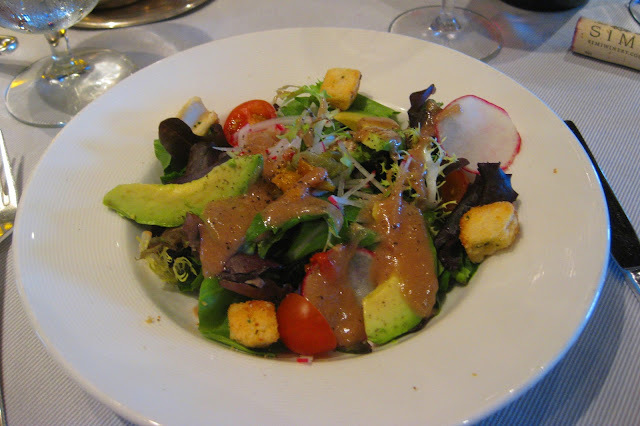 Juneau is also home of several well regarded restaurants and we enjoyed a delicious lunch at the Hangar on the Wharf restaurant, which had been recommended to us by the ship's doctor. Shore excursions are available for each port and can be booked prior to sailing through the cruise line’s web site. There is also the opportunity to book once aboard the ship as well, though the most popular excursions may sell out. In addition, many independent tour purveyors set up shop next to the docks in the ports, offering tours that may have different itineraries – and sometimes lower prices -- than those offered aboard. 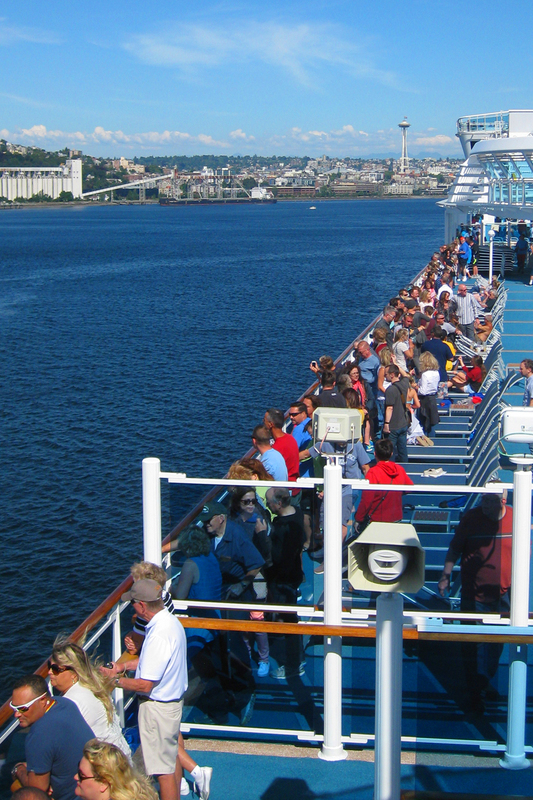 As do many first-time cruisers, we overpacked. That said, a variety of clothing is needed for the different types of weather one is likely to encounter on a cruise to Alaska. Even though we were surprised by much warmer weather than forecast, my wife did not need a fresh T-shirt for every day of the cruise. What she really needed were shorts or a sundress instead of those extra T-shirts. Formal night also necessitates clothing that may be bulkier and only worn once. Guests are not required to participate in formal night, but since we were guests at a shipboard wedding, we packed the appropriate clothing. It felt good to wear those outfits again for dinner at a specialty restaurant later in the cruise. Shopping must be more of a recreational activity than we expected: a daily newsletter insert highlighted shopping venues to be found at each port. And on board, in addition to jewelry and fragrance shops and clothing outlets, additional freestanding displays appeared throughout the week to further tempt the guests. First-time cruisers will do well to read the daily newsletter. It contains many good tips about the ship, the port of the day, etc. There is no lack of activities. The daily newsletter outlines activities literally by the hour, from about 7 a.m. to midnight (or simply, “late”). Take some time early in the cruise to get to know your ship. Ours contained some quirks that quickly became apparent, such as the fact that not all elevators went to all decks, and not all decks provided clear passage from the bow to the stern. Find two or three places where you feel comfortable for relaxing, watching the passing scenery, eating and drinking. Especially if you find a couple of favorite pubs and restaurants, as we did, get to know the bartenders and servers. 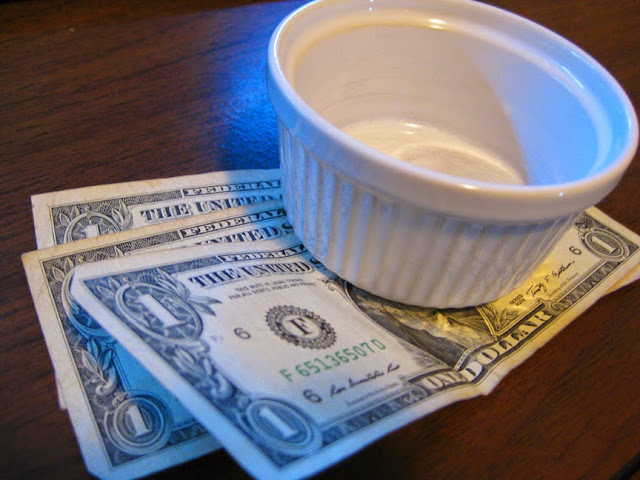 That connection will help ensure good service, as will leaving a few dollars in cash when you get your drinks or when you leave after enjoying your meal. Yes, most cruise lines add an automatic (though voluntary) gratuity amount but you will be amazed at the extra appreciation you will be shown if you leave just a few dollars more. Would we go again? Absolutely. The scenery in Alaska was stunning. It is on a scale quite different than elsewhere, or “Outside,” as Alaskans refer to anything not Alaska, so the scenery alone made the trip worthwhile. The service on the Ruby Princess was attentive, our stateroom and the other facilities were excellent, and it was a very pleasant experience overall. The only downside is that, for our taste, the ship was too big. It took practically the entire week to get our bearings and that is unusual (at least for Carl). We would prefer a more intimate experience aboard a smaller ship. But with that single caveat, we would definitely go again. In fact, we can't wait! That was so helpful. Thank you, both, individual and together, for an enlightening review of your experiences on board the Ruby Princess.You have all the attributes of articulate writers for a travel magazine. I wish you success in your future endeavors and hope to read your contributions, when they appear. Thank you, Alphonso, for your kind words. Please check back with TheTravelPro as you are able. I endeavor to publish at least one article every weekday with the exception of holidays. Of course, not every article will be based on our personal experiences but we will feature those as we are able. Jenni, I'm less impressed than you. We did have excellent service, but CruiseWatch.com says the Ruby Princess is No. 153 in crew to guest ratio, with less than 0.4 crew per guest. Many SilverSea, Seabourne and even Disney ships have better ratios. The No. 1 ship, the Crystal Espirit, has 1.5 crew for every guest.